With 8 zipline crossings, seasonal waterfalls, and incredible mountain and ocean views, Skyline Eco-Adventures' Kaanapali zipline course offers a trip of a lifetime! 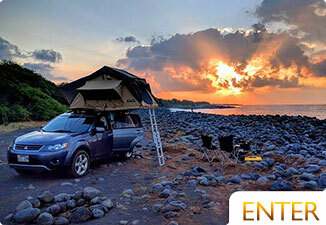 Their location is incredibly convenient for anyone on the west side of Maui. "It's just amazing! We got to see the outer-islands and it was beautiful." "Every line you do, it just get's better and better!" Safety is always Skyline's priority. It's nice to know that your guides are watching out for you, so you can concentrate on the scenery and on having fun. Your guides will hook you up and disconnect you to the line on each run, which keeps you safe. While ziplining, you are in control of your body rotation. It's very easy to do, and as you get more comfortable, you can challenge yourself by zipping backwards or sideways. Pretty much everyone on the tour will end up doing this at one point or another. It usually takes a few lines for us to feel comfortable experiencing different directions and different views. Tons of fun! While you munch on delicious complimentary grub, you'll enjoy views of west Maui and Kaanapali from the valley of Kahalawai Mountain. We keep saying it, because we're impressed. 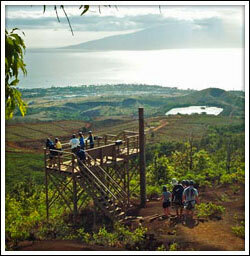 Skyline provides some of the best food you'll get on an activity on Maui. Everything is fresh and delicious. Every time, we're a little surprised on how good it is. It's especially nice having a little break to eat after hiking for a while. Make sure to wear closed-toed shoes and to not go scuba diving within 24 hours of your ziplining. Yes, Skyline also has a great zipline course on Haleakala! We love this zipline because you can enjoy the day shopping and dining Upcountry in Makawao or Kula before and after zipping. You also pass the fun town of Paia to get here. We especially love this area because of the views. With the elevation Upcountry, you're able to see views of the whole island. "It's the closest thing you can come to flying." "Oh man, that was awesome! What an adrenaline rush!" • Safety - Safety is always Skyline's priority. It's nice to know that your guides are watching out for you, so you can concentrate on the scenery and on having fun. Your guides will hook you up and disconnect you to the line on each run, which keeps you safe. • Eucalyptus Forest - Though eucalyptus is an invasive tree, they sure do create beautiful scenery and pleasing scents. 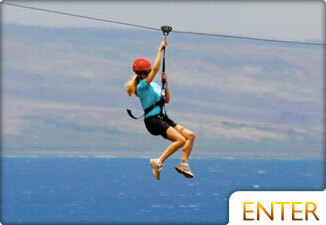 • Exciting Controlled Zipping - While ziplining, you are in control of your body rotation. It's very easy to do, and as you get more comfortable, you can challenge yourself by zipping backwards or sideways. Pretty much everyone on the tour will end up doing at one point or another. It usually takes a few lines for us to feel comfortable experiencing different directions and different views. Tons of fun! • Indiana Jones Bridge - We like the "Indian Jones" style bridge you cross. Hanging bridges make for good photos so bring a camera. • 5 Progressive Ziplines - There are 5 lines you'll be crossing. You can tell that this course was the first course in the United States! Reason being that they set it up to help first-timers. Each line increases in speed and length (and excitement.) This is perfect for those that are a little scared to try such an adventurous activity. • Our Favorite Line -Our favorite line on the island is the last one on Skyline's Haleakala course. It's incredibly long and fast, and you end up going back and forth for a while. It's hard to explain, but trust us: You'll love it! 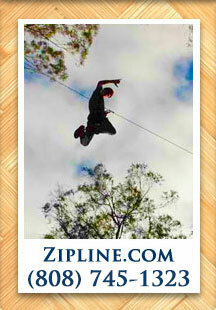 • Low Price - As far as we know, this is the best priced zipline on the island. You get your money's worth and some.